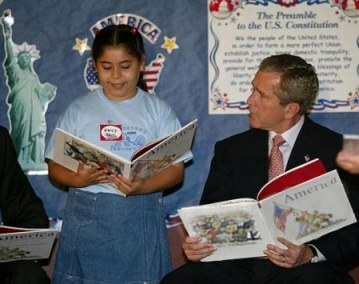 Many have seen the recent picture that purports George Bush to be sitting next to a school girl while holding a book upside down. I received the photo as an e-mail forward from more than one source, which leads me to believe that it may have been circulated widely. Some swore the photo was real. Others, like myself, had doubts. I created a second image to show how photos like this can be manipulated with a computer graphics program. The first image is the one I received. The second is my “manip” (I still don’t know if the first is real or fake or where it originated). I also list the steps I took to make the second image with Paint Shop Pro. Open the image in Paint Shop Pro. Use the Freehand tool to carefully select the front and back covers of the book. Get as close to Bush’s hands as possible without actually touching them. Return to the original image. Dip the Dropper tool in a portion of the white area of the book. Using the Paint Brush tool, paint the book cover white (the color you dipped with the Dropper). The Paint Brush Tool Option settings should be about 12 for size and 80 – 90% opacity. Give special attention to the inside edges of the book cover. Use Soften in the Retouch tool to blend the whites on the book cover. With the newly pasted image, select “Image,” then “Rotate.” The Direction should be set to “Left” and Degrees to “180.” Click “OK” and the image is turned upside down. Use the Freehand tool to draw around the left side of the pasted image (the cover of the book showing the flag). Back at the original image, select Paste as New Layer. Position the new layer on just above Bush’s left hand. Select “Image,” then “Rotate” left about 10 – 15 degrees. Make sure “All Layers” is unchecked. Use the Eraser tool to make portions around the edges white and blend the pasted layer into the white cover. Varying opacity and size settings will be necessary. Repeat Step 3 but for the right side of the pasted, rotated book image, drawing around the right side, copying and pasting it onto the side of the original book image next to Bush’s right hand, rotating and blending as appropriate. The “Perspective – Horizontal” effect under “Effects,” “Geometric Effects” in the file menu can be used to angle the new book cover layers pasted on the original image. Darken the side of the book cover by selecting, then choosing “Colors,” “Adjust,” then “Brightness/Contrast” from the file menu. The above photo is assumed to be in the public domain. If you believe otherwise, please inform the Clickfire webmaster. I am not a friend of Mr. Bush and what he does at all (just like most people over here in Europe), but I think you’re right, the upside down book is a fake. If you have a look at the back cover image, you will see that the sides of the image almost reach the edges of the cover – if you compare that to the book in the girls hands, you will see that there is some free space from the side of the image to the side of the book cover (larger distance than to the top of the book). Additionally, the image on Bush’s book isn’t rotated as it should be; the image is mirrored! So this has to be a touch-up job. 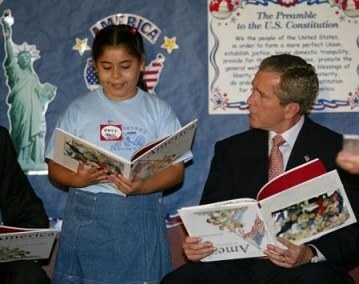 Compare your version of the “corrected” image on Bush’s book to the image of the girl’s book – you rotated the image correctly, but it is still mirrored compared to the image of the girl’s book! Thank you for showing the world the correct way for the prez to hold a book. Now if he had only held it correctly the first time he could have saved himself and the GOP so much embarrassment and humiliation. Though this now old but i still agree with Thomas that some guy used computer graphics program to distort how the American president held that book. What about MS Paint? Is it the same as Pro? @Skooma – I think this could be done with any graphic editor program that allows layers. Photoshop, Fireworks or MS Paint as I hear it supports layers now.